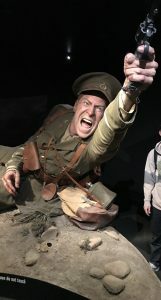 A larger-than-life display of a kiwi soldier fighting in the Gallipoli battle during WWI. Our first free day in Wellington consisted of rest and time exploring the city! The day before, we visited the famous Te Papa museum and got a special “back of the house“ tour of their “Mana Whenua” exhibit, which loosely translates to “authority of the land.” The Mana Whenua exhibit was one of many in the expansive museum, so we decided to come back the next day and explore the rest, especially since it’s free! One place we hadn’t checked out was the Gallipoli exhibition. Gallipoli was a battle during World War I where New Zealand helped other Allied forces invade the Gallipoli peninsula in Turkey. Sadly, the campaign ended with over 2,500 casualties on the New Zealand side. Despite the tragedy, the Gallipoli battle was very important as not only one of New Zealand’s first major steps in cultivating a sense of national identity, but also as the first battle where Māori and pākehā, or foreign settlers, fought together. In the exhibit, there was a large section detailing Māori involvement in the battle through The Māori Contingent, an all Māori battalion, which landed in Gallipoli in July of 1915. The display described how important Māori involvement was in the battle, earning them the respect and admiration of British and pākehā troops. But it also stated that many have overlooked their involvement historically. Seeing this reminded me of the fact that many modern treaty settlement claims being assessed by the Waitangi Tribunal are related to the health issues of Māori veterans involved in World War I and the Vietnam War. For context, the Waitangi Tribunal is a group of people tasked with hearing Māori claims of Treaty of Waitangi violations by European settlers. Part of the treaty claimed that Māori would gain the same rights and liberties as British citizens. However, after coming home from war many Māori soldiers were not given the same treatment as the pākehā veterans. Today, the grievances of Māori veterans, especially relating to PTSD, are finally being heard and settlements are being advocated for by the Waitangi Tribunal. Learning about the Tribunals current efforts and seeing the Māori Contingent soldiers receive recognition in the Gallipoli exhibit has made me hopeful that Māori veterans will be rightfully compensated for their service in the near the future. This entry was posted in Our Experiences and tagged history, Indigenous Knowledge, Maori, representation, Wellington, WWI on September 9, 2017 by risen. Today Meka Whaitiri, a member in the Labour Party, warmly greeted us and gave us a tour of the Parliament. She met us in the Māori Affairs Committee Room, which is located in the main Parliament building. The room served a similar function as a Marae, and the interior was similar to a Marae as well; instead of poupou (carvings on wood panels inside the meeting house of a Marae that usually have connections to ancestral lineage), there were portraits of previous Māori politicians. We were greeted in a fashion similar to a pōwhiri (a welcome protocol): exchanging a speech and a song, followed by the hongi. I found the resemblance to a Marae protocol to be significant in regards to not only paying respect to Māori ancestors and culture, but also to empowering Māori people who are involved in politics and represent their iwi (tribe). During the tour, we were taken to the court room where new laws are passed. The room had the names of countries that New Zealand had fought in war with. Following the tour, we had morning tea with Meka and discussed more about the Parliament. It stood out to me when Meka told us that there are some Māori members of parliament (MPs) who acknowledge their Māori whakapapa (genealogy) only when it is convenient or beneficial. In doing this, the genuine motive to represent Māori interests becomes illegitimate as well as the intention to represent the whakapapa that these MPs now conveniently claim to relate to. I found it disheartening that considering how proportionally little Māori there are in parliament, these Māori MP choose to represent certain sides or issues and turn to their whakapapa almost as a last resort. With whakapapa being a significantly large part of Māori culture, relating to their genealogy when convenient seems to undermine the roots of the culture and heritage they claim to have. We had visited The Waitangi Tribunal two days before visitign the Parliament. The Waitangi Tribunal (a government entity) looks into past and present breaches from the Crown to the Treaty of Waitangi. The members at the Waitangi Tribunal are mostly all of Māori descent. After putting in immense time and effort of looking into claims, the Tribunal produces a written report that underlines Crown breaches and highlights recommendations regarding the claims. Despite that these reports are only recommendations and are not binding results, the members are extremely dedicated to the work they are doing. They were doing work that, although would not give affected Māori peoples any compensation for the hardship caused by breaches to the Treaty, they believed would make a difference. In comparison to the certain Māori MPs that only use their Māori genealogy to benefit themselves in politics, these Māori members at the Tribunal strongly held onto their whakapapa and used that as motivation. These visits made me reflect on how Māori sovereignty in politics can become distorted due to how power is allocated to different political and government entities. The interests of MPs often do not benefit the whole, and can lead to malpractice. On the other hand, the system of politics sheds little light onto the Māori peoples (or groups like the Waitangi Tribunal), and this creates an environment where genuine interests are not prioritized. 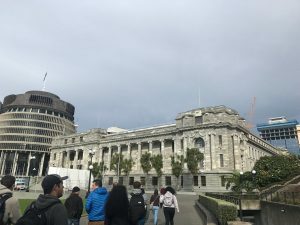 This entry was posted in Our Experiences and tagged Aotearoa, Auckland, Indigenous Knowledge, Maori, parliament, representation, sovereignty, Wellington on September 8, 2017 by Eunice Lee. We came back from Matiu/Somes Island early this afternoon. 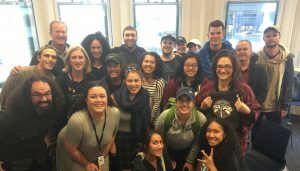 After settling back into our hostels at the Dwellington, we had the privilege of meeting Leanne Tamaki with the Treaty Settlements Stories project. 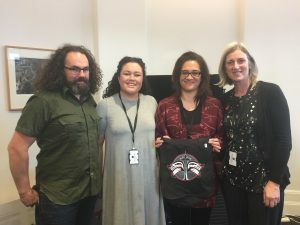 Their plan is to collaborate with leading historians, other Ministries, research institutions, and universities to bring forth the stories of iwi and hapu (maori people and family). The project aims to produce multimedia and multiplatform publications accessible to the mass population that will amplify the unheard voices and silenced stories of Maori people in regards to the treaty settlement. One of the slides that Leanne shared with us was a statement from former Prime Minister “…we absolutely must teach an honest history of the settlement period… that’s the only way you can get acceptance of what still has to be done to correct some of those errors in the past.” One of the objectives of this project is to better inform the Maori people about the treaty – Maori people know a little about the treaty but don’t completely understand what exactly happened or the details of it. The content of this project can be used in public education and contribute to a better informed and understanding New Zealand public. The tragedy for New Zealand was not only having their land unfairly confiscated but also that they had no idea. I found this project empowering and of vital importance to the people of New Zealand – it is absolutely necessary for them to recognize the errors of their history and hear the voices of Maori people in regard to the treaty settlement. I wasn’t surprised to learn that a project like this was rising – this is a land of resilient indigenous people. The objectives of the Te Taiwhakaea: Treaty Settlement Stories project intersects with our course’s themes of sovereignty and representation – it creates space where the team can produce and control content that will project the voices and stories of from all perspectives, educate their youth of their true history, and distribute information that will reach the mass population. With this project, they are able to represent all voices of their people that were unheard. Te Taiwhakaea Treaty Settlement Stories Project team with UW class! This entry was posted in Our Experiences and tagged Aotearoa, representation, sovereignty, Stories, Te Tewhakaea, Treaty, Voices, Wellington on September 6, 2017 by Aleila Alefaio. Today our class found ourselves on the glorious island of Matiu, or as some call it Somes island as well. Being owned by the Maori but operated by the Department of Conservation I was curious to see how these ideas came together on the island. 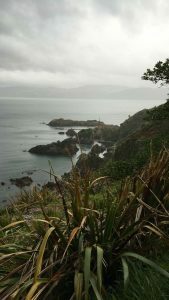 While the previous day the rest of the group and myself went off exploring the island and interacting with its environment, today we got to see the Maori portion, or lack thereof in Matiu Island’s case and how it intersects with the environment. A view of the island’s edges. After our class session and some down time on the island, we got to meet with one of the rangers who provided our group with a lot more information on the Kaitiaki Plan and the Maori representation on the island, which other than the carved gate we saw at the wharf of the island was simply non-existent. From the ranger, we learned of the reason for this: despite the lower down rangers wanting to get the local Iwi’s (tribes) who owned the island involved more heavily, their efforts got consistently bogged down by the bureaucracy. The rapid turnover that takes place on the trust board that deals with Matiu Island makes things incredibly slow to move forward on the island. Furthermore, there is a lot of other Taonga (treasures) that this trust board has to deal with which take up time as well, and without proper resources to be able to address these areas, Matiu Island then lacks the proper cultural representation. Sadly this is many times a fact in democracies and with the bureaucracy, the wheels turn at a snail’s pace, and it is quite frustrating to deal with. 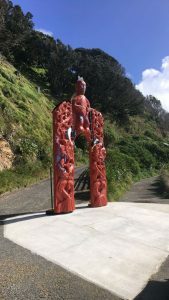 The carved gate to Matiu Island. In a bit brighter spot from the lack of the Maori representation on the island, the environmental preservation and conservation programs seem to be doing quite well. The island’s had recent successes with several endangered species, including the Tuatara, a lizard native to only New Zealand, and the Kakariki, another endangered parakeet as well. Coming from what was once a barren island that was a quarantine station for Wellington and the surrounding area, now it is a verdant green island that is predator free and well protected. Though, as an environmentalist, the tree situation here was amusing and irritating; most trees aren’t from the area, or even New Zealand. I understand why this is though, back when the trees were planted, they put whatever they could get on the island, and are working on changing it now. All in all, I was really interested in being able to explore and experience Matiu/Somes Island. I think that the island was a good look at how the Maori and Environment intersect, and the various issues relating to these themes. Also, I’m interested to see further into the government’s perspective in Wellington after getting a glimpse of it on the island. The trip out was a wonderful experience and I look forward to what Wellington will bring us in our knowledge. This entry was posted in Our Experiences and tagged Aotearoa, Environmental, Maori, Wellington on September 5, 2017 by vallen. After a stimulating class discussion about representation of Maori culture and identity in Aotearoa, I was itching to explore Wellington on our first full day in the city. 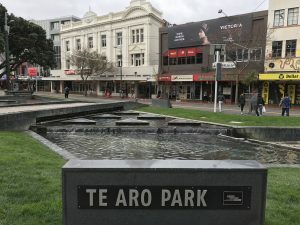 I particularly wanted to see Te Aro Park, which according to a landmark map in our hostel, was the site of one of the largest Maori settlements in the Wellington area. Our class has had a lot of exposure to modern Maori culture and spent time on modern maraes, but I was excited to learn about what a Maori settlement looked and felt like hundreds of years ago, prior to the presence of large cities here. Racquel, David, and I bundled ourselves up in coats and hats and began our trek across town. Te Aro Park, the former site of one of the largest Maori settlements in the Wellington area. After 25 minutes of fighting the wind—Wellington is known as the windy city of New Zealand—we arrived at the park. The space was filled with murals and sculpture, pools of water, and small trees. However, I saw no obvious evidence of any remains of a large Maori settlement and I began to wonder whether or not I was in the correct place. After a few minutes of searching the park, the three of us found a small plaque that confirmed we had not mistaken the location, stating that the area had been settled as recently as the 1890s by as many as 200 Maori. The plaque went on to say that since then, the space had also been a Mission House, several public service stations (police, fire, and electrical), and a Turkish bath, among other things, until the park as we found it opened in 1992. The surprise between the three of us was palpable; how could a place of such important cultural heritage so often be repurposed? The three of us went on to see and do several other things throughout the day, but I remained mentally present at Te Aro Park. I thought a lot about the park in relation to Maori representation, and the place that Maori people occupy in the overall representation of Aotearoa. In our class discussion from earlier that day, we talked about how native peoples tend to lose land and resources because they lack the power to represent their interests. In our travels across the country, we have seen and heard numerous examples of this loss of land and resources. What was a thriving Maori settlement as recently as 120 years ago, Te Aro Park—now situated between two busy streets lined with shops and restaurants—is yet another example of the constant struggle for representation and relevance that the Maori face. This entry was posted in Our Experiences and tagged Aotearoa, representation, Wellington on September 3, 2017 by mj4881.